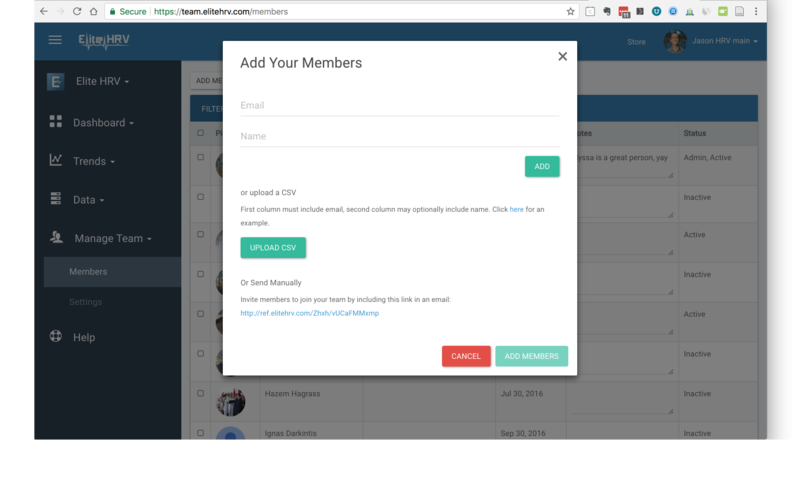 Inviting Members to your Team creates an automatic smart link for them to join from. In the Team Dashboard (https://elitehrv.com/dashboard), navigate to the Members page. Click "Add Members" at the top of the page. When finished inputting Member information, tap Add Members to send the invitations via email. Members should open the invitation from their Android or iOS smartphone for the best experience. Monitor the Member page to approve of incoming Join requests. Copy the smart invite link from the bottom part of the popup. SMS, email, or message the link to your potential Team Members. 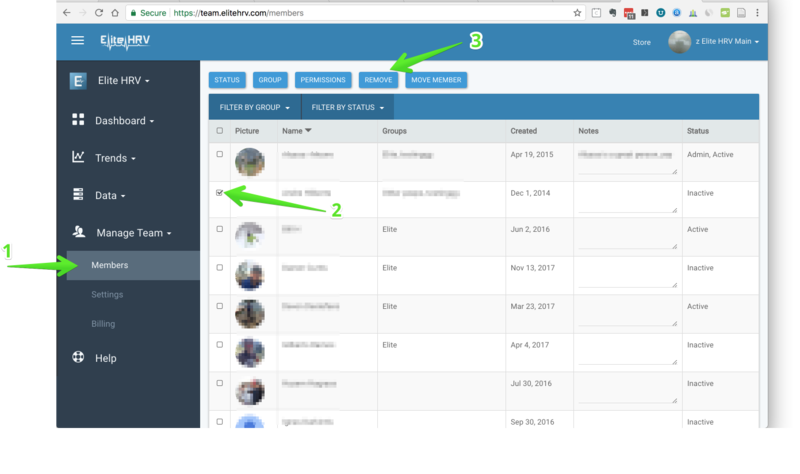 As the Team Owner, you can easily edit or remove members from your team at any time. Check out the video below, or scroll down for an example of how to remove a member. Under "Manage Team" on the left side menu, click "Members". Select the checkbox next to the member or members that you wish to remove. Click the "REMOVE" button above the table. Click OK in the confirmation popup. If you accept a Member without activating them or if you previously set them to inactive, here is how to then activate them for analysis. Team Owners are automatically granted Admin abilities. Further, Team Members can be promoted to Admin status (link). Many Teams elect to not activate their Admins, because they don’t want to analyze the Admin’s HRV data – others opt to activate the Admin so that the Admin (or other Admins) can see their data as well. 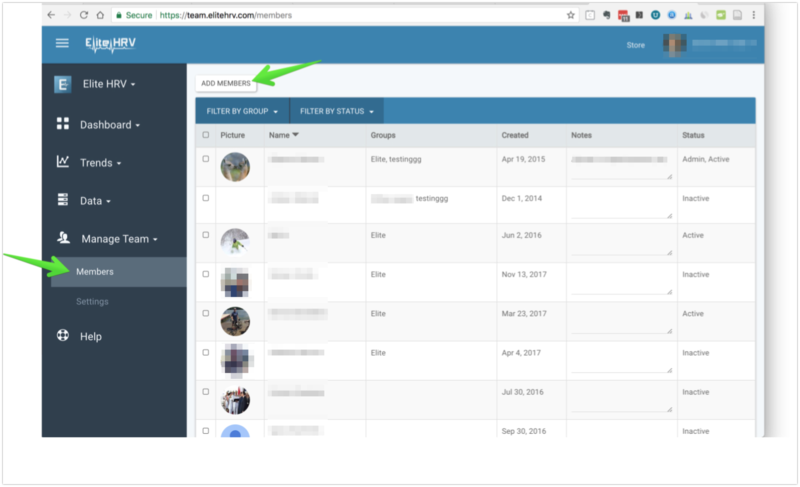 To activate an Admin or Team Owner as a Member that can be analyzed, follow the same steps listed in “Activating Previously Inactive Members”. To deactivate an Admin or Team Owner from being an analyzable Member, follow the same steps listed in “Activating Previously Inactive Members” but choose “Set Inactive” instead of “Set Active”. A Team Owner or Admin that is “deactivated” can still view the data of other, activated Members.